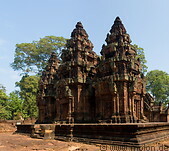 Banteay Srei is a richly decorated, late 10th century Hindu temple dedicated to Shiva. It is built in red sandstone and has beautiful bas-reliefs and decorations. It is surrounded by three enclosures with the central structure being surrounded by a moat. 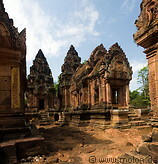 Banteay Srei lies 25km to the north of the main Angkor temples.